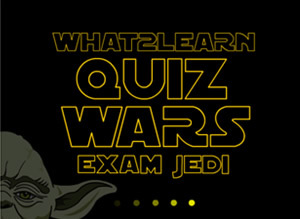 Exam Jedi is the second game from our Star Wars themed ‘Quiz Wars’ interactive learning games. This has now been added to our ever-expanding learning game generator. Students will travel to the planet Dagobah and answer an exam-style question as part of their Jedi training. Requiring students to provide long written answers, it offers a powerful and effective learning activity. See ‘Save Vader‘ to create a hangman game within our Quiz Wars trilogy of learning games. Students are presented with an exam-style question and are asked to provide an answer. Their effort is automatically graded and feedback given to help raise performance. A great tool for drilling students in exam preparation and helping them to get straight to where the points are. Like all of the activities in our game creator, it is easy to create an Exam Jedi game and it can be applied to any subject area. Although not difficult to create, it is important that you take your time and follow instructions carefully in order to create your Exam Jedi game. Our game generator was originally designed to take 8 questions and 8 answers so we had to get a little creative in making this work for this style of activity. Click here to download the instructions for making an Exam Jedi. See the scores your students get in your game. Learn more. Embed it in your own blog or website. Learn more. Add it to a PowerPoint presentation. Learn more. Add it to a Moodle VLE. Learn more.